Here's a look at my messy work space. I also had a cup of water right above the paper towels. Do you see the templates above the cookie*? I centered one on each cookie and traced around it with a coordinating food marker, which helped tremendously in painting the cookies. Other than the marker template tracing, paint (gel) was used exclusively. (I never did use the sharp etching tool in the upper right of the photo.) A wide variety of gel food colors came in very handy for these colorful critters, though I sometimes could not tell which color was which until I dabbed it on the paper towel. Maybe I should have put them in some sort of order in the wells of the mixing tray, or labeled them somehow. A couple of times some of the paint ended up where I didn't want it, but the cotton swabs helped perfectly to dab up any mistakes. Some of the hedgehogs were made a bit more girly by adding a bright, daisy sprinkle to adorn them. That makes six boys and six girls:) Each cookie is 4-inches by 3-inches. I had so much fun painting these cookies! I found the gel colors very easy and forgiving to work with. I just used one paintbrush the entire time, the smallest (#0) in the cheap inexpensive pack. The paper towel was a must to dab the brush on, and of course the water was essential for dipping the brush to dilute the paint and to rinse between colors. An extra cookie may be helpful too, for practice. Before starting to paint, make sure your cookies are completely dry. Btw, this lime green fabric is actually the pretty side of a table runner sent to me by Scribble Linens (Thank you, Sarah). The other side is chalk cloth:) It's such a fun, versatile product! You really must check out their site! You can also see it HERE on my recent post. 1. After you have baked and iced your cookies, let them dry completely. 2. Using a template, outline your subject with food markers. For a novice like me, this was very helpful, since the cookie is not shaped like the subject. 3. 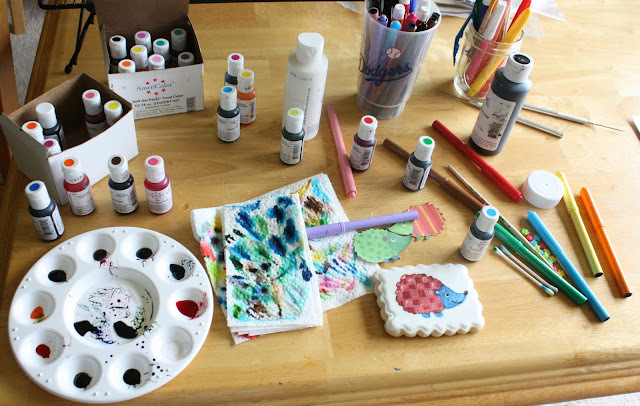 Put a dollop of each gel color you will be using in separate wells of the paint mixing tray. 4. Fill a shallow cup with clean water, set out a couple of paper towels and your brush(es). Also, have a few cotton swabs nearby to dab up mistakes. 5. Paint away! If you want a more dense color, don't dilute. If you want a lighter color, dip the brush in water and blot it on the paper towel. You don't want too much water on your royal icing, though I didn't have any problem with that. Experiment. 6. In painting the hedgehogs, I didn't wait for any additional drying time before adding the details. As soon as I filled in the body and head, I then added the design on the body and the face details. I used the brush for the nose, mouth and whites of the eyes, but for the iris, I used the paint brush handle. I dipped the end of the brush handle tip straight down into the black gel, did one "blot" on the side of the mixing tray and then applied it straight down onto the white eye, and then lifted it straight up. Ta da! 9. Most importantly, have fun; I sure did! Thank you Georganne (Lilaloa) for hosting a fun challenge each month! I loved this one! Absolutely adorable! 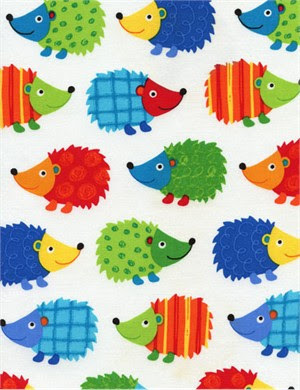 Colorful hedgehogs are so much happier than plain ol' brown ones. So sweet. OMG, these are just too adorable. Your inspiration was absolutely perfect. I love the fabric too. My niece actually has an albino hedgehog. It is still a tiny little baby. It is so darn cute. She would love these cookies. How cute Sue!! I couldn't tell for sure if they were the fabric or the cookie!! thud. you just killed me with cuteness overload. Ahhh.....hello adorable cookies! Super, super cute...I just LOVE them! Every time I visit your blog, I think you can't possibly come up with anything cuter. And I'm always wrong! These hedgehog cookies are the most darling thing I have ever seen. So adorable! The cutest ever, so, so sweet! OH. MY. GOODNESS. They are ADORABLE!!! And the little bows!!! Complete cuteness overload! So fun! You always amaze me with your talent. Oh my....these gotta be the most adorable Hedgehogs I've ever seen! 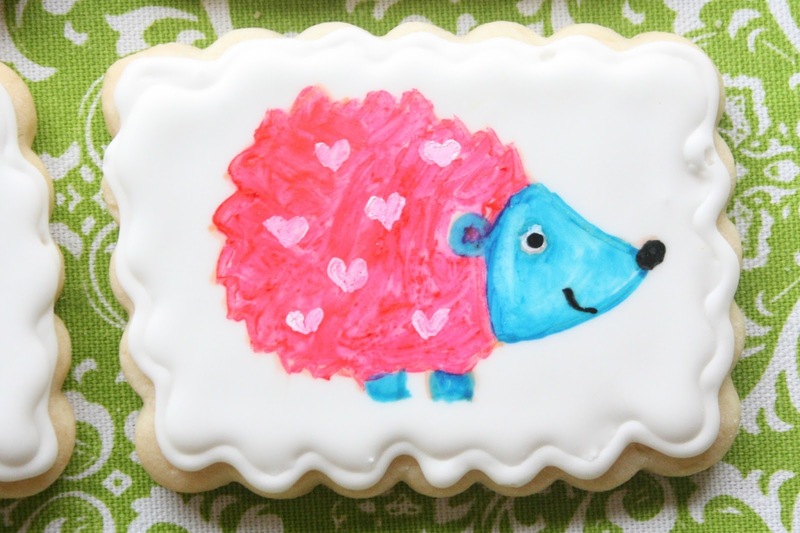 Truly love your Hedgehog Cookies! Oh, madre mía! Son realmente preciosas!!!!!!! Me encantan!!!!! Muchas felicidades! I like to refer as Sue, the cookie artist! You are so talented with your cookie decoration and your creativity and inspiration never end. 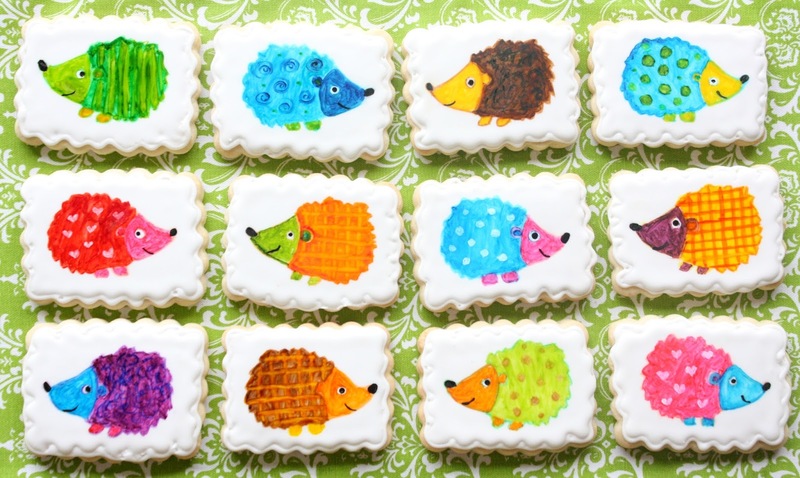 These hedgehog cookies are so cute! I love your hedgehog cookies! I love how you used fabric for inspiration! So smart! Those are so adorable! My kids would love them. Wow, those are stinkin' cute! I think any kids (and adults) would learn they loved hedgehog! I can`t believe that these are cookies! They look like pictures! But is it safe for kids? I mean, there are so many food colorants and as far as I know they are not very beneficial, especially small kids, or are they safe? These are so adorable. My daughter has a hedgehog and she would love these! These cookies are adorable!! You are so talented... I could never make these! gorgeous sue! how long did it take you??! Thanks Michelle! It took me about a couple of hours, I think:) It was faster than royal icing decorating from start to finish, I know that much! These are adorable and so very colorful! 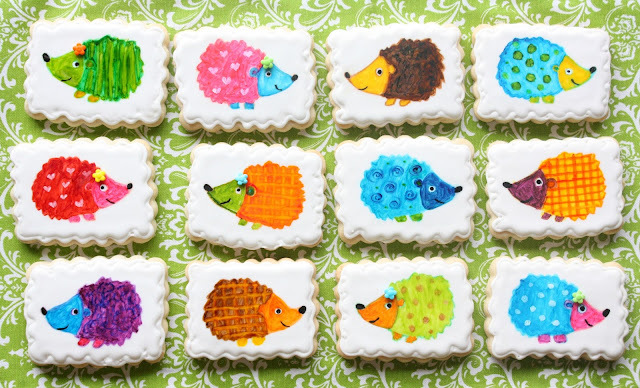 I don't think I have actually ever seen a hedgehog except on cookies :)Love the way they cam out painted! Super cute! I love how you painted the hedgies! !